Guest Isaac Alexander gives us a taste of aviation action in the Pacific Northwest. In the news: updates on the Boeing/Embraer deal, more WOW Air woes, Virgin Galactic test flight, MRJ engine final assembly in Japan, the Northrop Grumman Firebird MALE, an airline turnback to deliver a heart, and a pet fish. Plus David’s holiday story, Voyager spacecraft, and first flight comments. 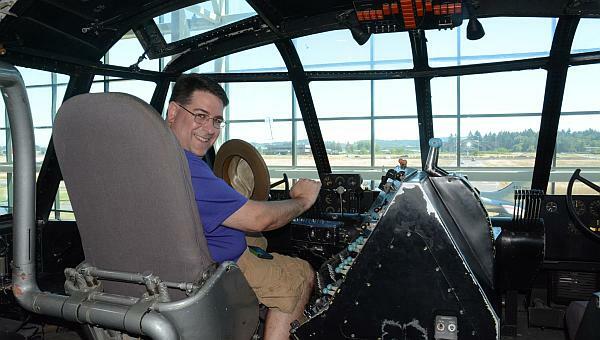 Isaac Alexander, Jet City Star, in the Hughes H-4 Hercules (the Spruce Goose) at the Evergreen Aviation & Space Museum in McMinnville Oregon. Aviation geek Isaac Alexander is a freelance aviation writer who blogs, tweets, and posts as Jet City Star from the Pacific Northwest. In the past, Isaac was on the committee for the weekend-long Aviation Geek Fest held annually in the Greater Seattle area. Isaac tells us about the aviation scene in the Pacific Northwest, including some of the aerospace companies based there, the senior roles held by women in area organizations, new scheduled service, must-visit museums and other attractions, recent aviation events, and some events coming up in 2019. Last week we reported that four congressmen with Brazil’s left-wing Workers Party won an injunction in Brazilian federal court preventing the Embraer/Boeing deal from going forward. Now a Brazilian federal appeals court has overturned the injunction. The dispute settlement panel at the World Trade Organization is examining subsidies received by Bombardier from the Governments of Canada and Quebec. The Brazilian Government (and Embraer) say the 19 subsidies violate Canada’s WTO obligations. More details about Brazil’s First Written Submission are available in the DS522 — FACT SHEET [PDF]. Budget carrier WOW Air is taking measures to keep the company in business. They announced a cut back in the number of airplanes from 20 to 11, they plan to sell four Airbus A321s, and reportedly the airline laid off 111 employees. Virgin Galactic has been flight-testing its VSS Unity rocket plane, carried by SpaceShipTwo. The Mitsubishi Regional Jet (MRJ) is exclusively powered by the Pratt & Whitney PW1200G engine. In Komaki, Japan, Mitsubishi Heavy Industries Aero Engines (MHIAEL) has completed their first final assembly of the engine for the MRJ flight test program. Pratt & Whitney’s Mirabel Aerospace Center in Canada will also assemble and test the engine. Mitsubishi Heavy Industries (MHI) bailed out/restructured debt by Mitsubishi Aircraft Corporation (MAC). Northrop Grumman is developing a Medium Altitude, Long Endurance (MALE) unmanned aircraft called the Firebird. It’s being developed for aerial surveillance missions and its history goes back to Northrop Grumman subsidiary Scaled Composites that built an optionally manned demonstrator which first flew in 2010. Someone forgot to unload a human heart from a Southwest Airlines in Seattle. During a subsequent flight of that plane, the error was discovered and the plane was forced to return to Seattle. “Cassie,” the student’s beloved pet betta fish, was refused boarding on a Southwest flight, despite being allowable according to the TSA website, and previous travel on the airline. David Vanderhoof tells us a Christmas story filled with historical figures. Drone shatters passenger jet’s nosecone & radar during landing (PHOTOS) and the Tweet with photos. JPL Voyager Mission Status page. Instagram photo of DC-3 by @mikeymcbryan. This entry was posted in Episodes and tagged Boeing, Bombardier, Embraer, Mitsubishi Regional Jet, Northrop Grumman, Southwest, Tanker, Virgin Galactic, WOW air on December 19, 2018 by maxflight. Lockheed Martin and Airbus take another run at aerial tankers for the US Air Force, air marshals behaving badly, a Brazilian court blocks the Boeing-Embraer deal, airport biometric identity checks, a pilot and a pickup app, AOPA’s STEM program, an Antonov An-124 stationed at Houston, the Boeing 777X BBJ, and Voyager 2 in interstellar space. Also, a aviation events Max plans to attend in 2019, his Eat at the Airport project, who flew controlled powered flight first, and more on ion drives and aircraft noise. In 2008, Airbus and Northrop Grumman won the contract to build tankers for the U.S. Air Force. But the award for A330-based tankers was overturned and in 2011 Boeing won the contract for 179 tankers based on the 767 aircraft, the KC-46. Since then, Boeing has been beset with difficulties and has failed to be on time or within budget. Now, Airbus and Lockheed Martin have signed a memorandum of agreement on aerial refueling and are willing to “provide aerial-refueling services to address any identified capacity shortfall and to meet requirements for the next generation of tankers capable of operating in the challenging environments of future battlespace.” See the press release: Lockheed Martin And Airbus Sign Memorandum Of Agreement On Aerial Refueling. On August 20, 2018, there was some confusion aboard a Republic Airlines flight operating as United Airlines flight 3531 from Newark to Minneapolis. Two armed air marshals were aboard the flight, and the flight and cabin crews were unaware of the marshal’s presence, one of whom identified himself by flashing his gun. The pilot reported a possible hijacking attempt and when the plane landed police arrested the two marshals. 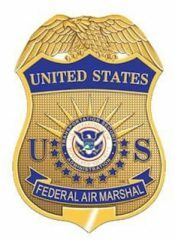 The TSA’s Office of Inspection has documented more than 200 cases of air marshals allegedly misusing firearms or misbehaving with guns between 2005 and 2017, according to records obtained through a Freedom of Information Act request. Embraer likes the proposed tie-up with Boeing. Four congressmen with Brazil’s left-wing Workers Party not so much. They sought an injunction which a Brazilian federal court granted. The decision forbids Embraer’s board of directors from signing the deal to create a joint venture on commercial aviation that Boeing would control. Delta Air Lines and Atlanta’s Hartsfield Jackson International Airport now have the first U.S. curb-to-gate biometric terminal using facial recognition. The camera-based system compares scans of travelers’ faces to a database of verified ID photos curated by US Customs and Border Protection. A passenger received a message sent inflight from the pilot via an online dating service. 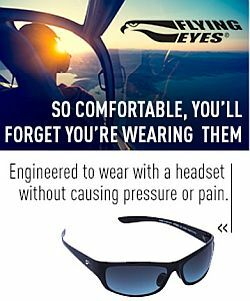 What should pilots do and not do with their time in the cockpit? 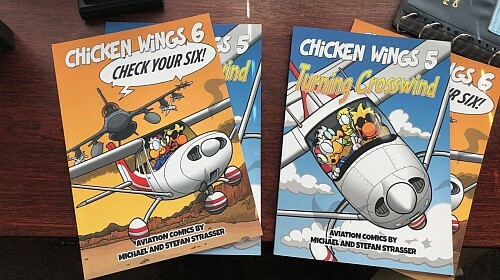 The Aircraft Owners and Pilots Association (AOPA) created a four-year STEM aviation curriculum. Classes are offered to ninth grade students and involve a mix of theory and hands-on projects. Eighty U.S. public, private, and charter schools are participating. Volga-Dnepr Group will base one of its 12 Antonov AN-124-100 planes at Houston’s Bush Intercontinental Airport. The company will provide crews, technical support teams, as well as special loading equipment. Boeing Business Jets announced it is launching the BBJ 777X, which can fly more than half-way around the world without stopping, farther than any other business jet. Customers have a choice between two models: the BBJ 777-8 and BBJ 777-9. The BBJ 777-8 offers the longest range of 11,645 nautical miles and a 3,256 sq. ft. cabin. 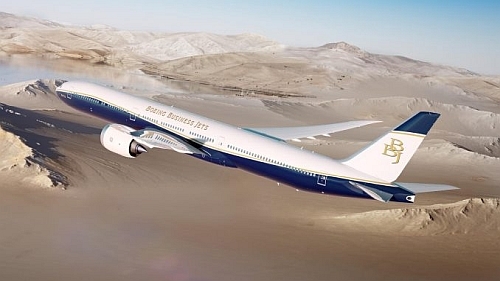 The BBJ 777-9 has a 3,689 sq. ft. cabin and an 11,000 nautical mile range. Boeing BBJ-777X computer rendering © Boeing. The Voyager 2 spacecraft has now left the heliosphere – the protective bubble of particles and magnetic fields created by the Sun – and crossed into interstellar space. This follows Voyager 1, which left the heliosphere 2012. In July 2015, NASA uploaded the audio contents of the golden records to SoundCloud. 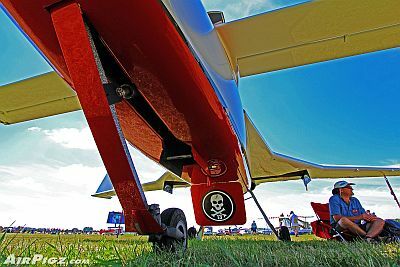 AvGeekFests.com – The calendar of aviation events. 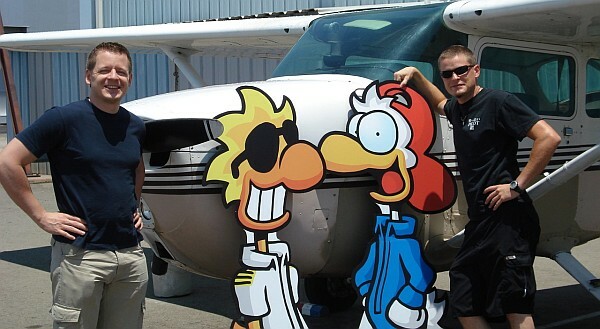 The Flying Monkey Grill and Bar at the Hartford–Brainard Airport (KHFD). This entry was posted in Episodes and tagged Antonov, AOPA, Atlanta, Boeing, Delta Air Lines, Embraer, Lockheed Martin, NASA, security, STEM, Tanker on December 12, 2018 by maxflight. 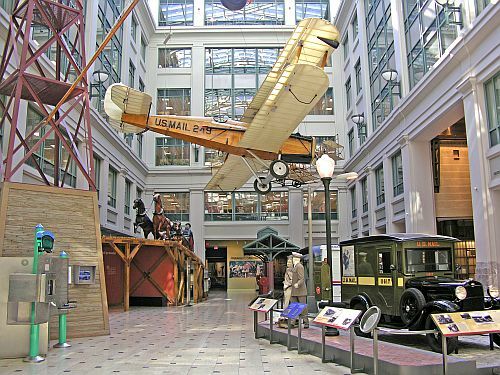 The Head Curator of the History Department at the Smithsonian’s National Postal Museum tells us about the early history of airmail service in the U.S., which is celebrating its 100th anniversary this year. In the news, Goodyear has a new airship, Facebook cancelled its Aquila project, Boeing has reportedly asked engine makers to bid for the 797, Boeing unveiled a hypersonic airliner concept, a stealth tanker model was spotted, the TSA wants to look at your snacks, a third Heathrow runway gets closer to reality, NASA demonstrates a quieter airplane, and the Air Force reduces pilot training time. 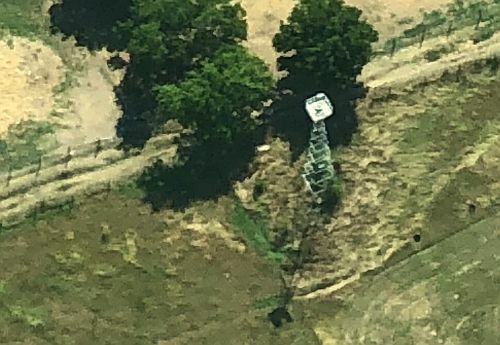 Also, finding airmail airway beacons, a conversation with Air Evac Lifeteam at the Circuit of the Americas, and student pilot Nicki talks about her new flight instructor. Curtiss Jenny carrying airmail to Philadelphia from Washington, DC. Courtesy National Postal Museum. 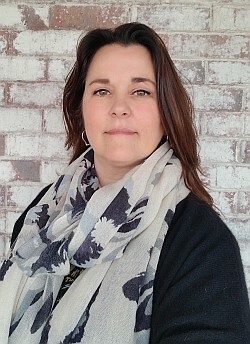 Nancy Pope is the Head Curator of the History Department at the Smithsonian’s National Postal Museum. 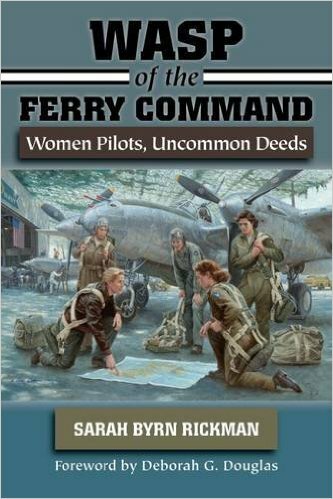 2018 is the 100th anniversary of airmail service in the U.S. and Nancy tells us about the early history of airmail, including the pilots, the aircraft, and the initial difficulties getting the service operating properly. 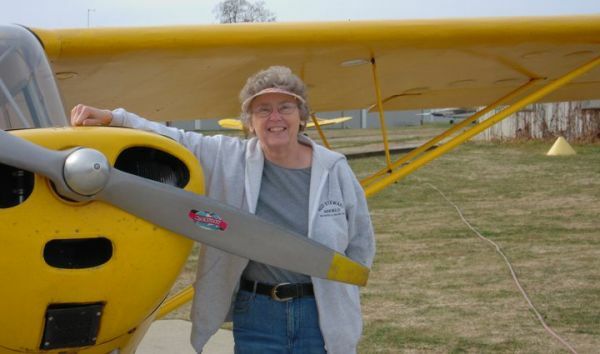 She talks about some of the airplanes and artifacts at the museum as well as the Postmen of the Skies: Celebrating 100 Years of Airmail Service exhibition that is open through May 27, 2019. Earlier this year, the first of two commemorative stamps was released. See: U.S. Postal Service Commemorates Air Mail with Stamp. 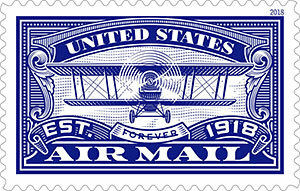 You can purchase the blue airmail stamp at the post office, or at the USPS online store. The second (red) stamp will be released Saturday, Aug. 11, 2018, at 11 a.m. at College Park Aviation Museum (1985 Corporal Frank Scott Drive, College Park, MD 20740). “Red Letter” day at the museum will be an exciting event to attend if you are in the area. See Red Letter Day: U.S. Postal Service Continues 100th Anniversary Commemoration. Followers of the U.S. Postal Service’s Facebook page can view the ceremony live at facebook.com/USPS. Nancy has worked with the items that are now in that collection since 1984. She curated the opening exhibits for the Museum in 1993 and more than a dozen at the museum since then. She has written about many elements of postal history, including the Pony Express, Rural Free Delivery, Parcel Post Service, the Postal Service during 9/11, as well as the later anthrax attacks and airmail. Nancy’s most recent exhibits are “Systems at Work,” which examines mail processing from Colonial America to the present, and “Postmen of the Skies,” a celebration of 100 years of airmail service in America. The Smithsonian’s National Postal Museum is located at 2 Massachusetts Ave., N.E. in Washington, DC. Admission is always free. 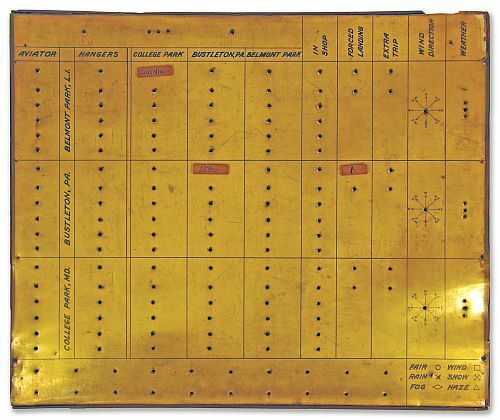 The logbook was recovered from Max Miller’s fatal crash on September 1, 1920. The Junkers-Larsen JL6 caught fire in midair. Max Miller and his mechanic Gustav Reirson died in the fire and subsequent crash. Miller was Praeger and Lipsner’s favorite pilot and his death hit both men hard. Though slightly damaged by the fire, the handwritten entries remain clear. Airmail pilots used logs to record details about their flights and, on occasion, landing field conditions. 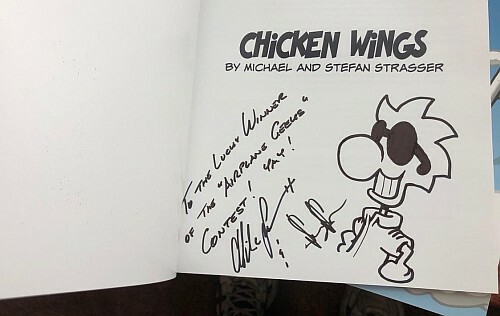 Miller wrote his name on the front of this book, adding the name of his service, the “U.S. Aerial Mail,” and a notation of his home address in Woodland Hills Park in Cleveland, Ohio. 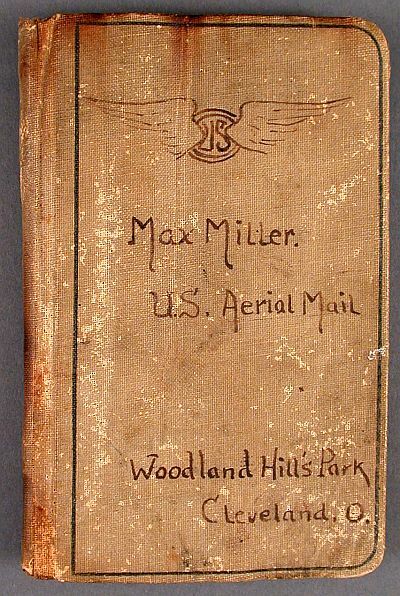 Max Miller’s logbook. Courtesy National Postal Museum. 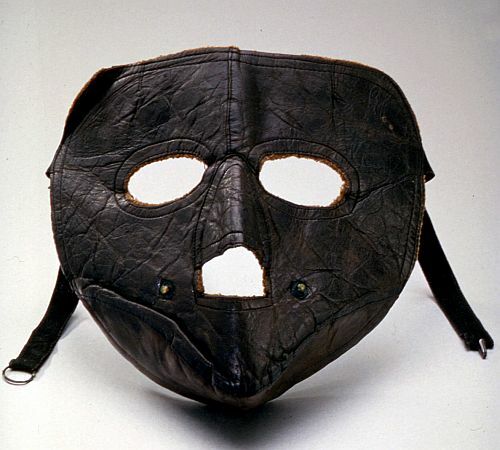 Eddie Gardner’s facemask. Courtesy National Postal Museum. The Post Office’s airmail flag. You will recognize the globe/wings that became the ubiquitous symbol of airmail. 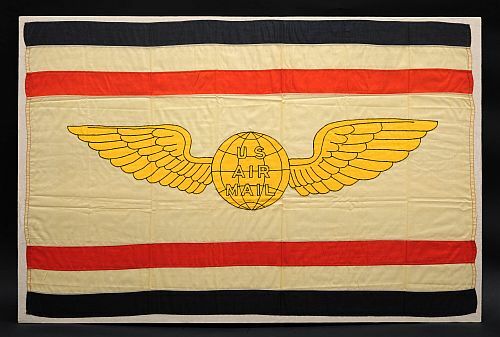 Postal Service airmail flag. Courtesy National Postal Museum. 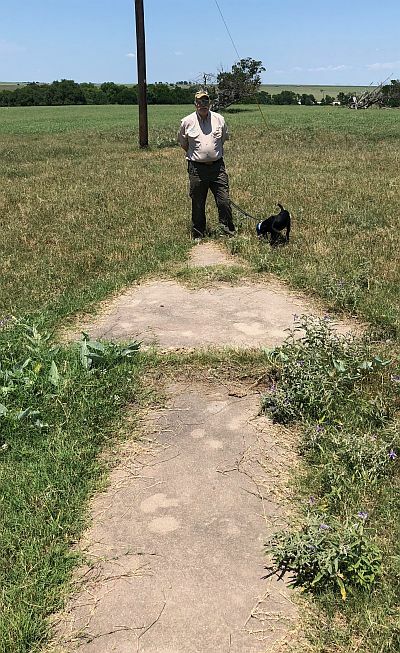 Our Airplane Geeks reporter-at-large Launchpad Marzari located some of the airways beacon sites in Texas that guided early airmail pilots. He sent in a report about what he found. 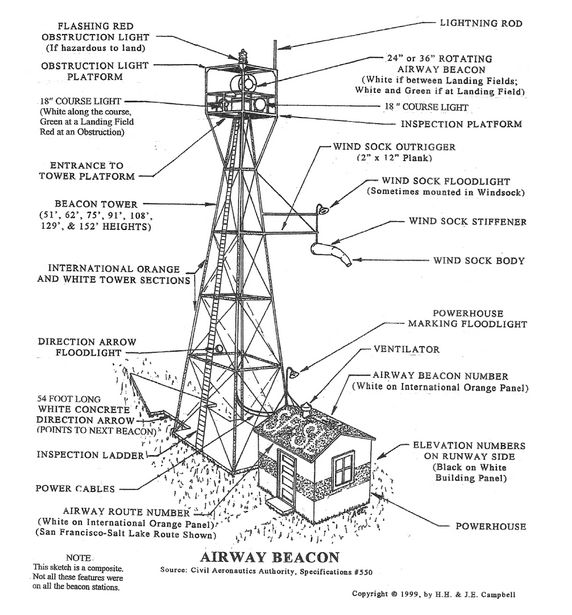 See Map of Airway Beacons and Arrows Across America to find these sites near you. Goodyear’s newest semi-rigid airship is the Wingfoot Three. Built by Luftschiffbau Zeppelin GmbH, the blimp still has to undergo flight tests before formal handover to Goodyear. Goodyear’s U.S. fleet consists of three semi-rigid airships: the Wingfoot One (N1A), based in Pompano Beach, Florida; Wingfoot Two (N2A), based in Carson, California; and Wingfoot Three (N3A), based in Suffield, Ohio. Compared to Goodyear’s old model, the GZ-20, the Zeppelin NT model is longer, a little narrower, faster, and seats more passengers. Facebook has canceled the Aquila project – a solar-powered “atmospheric satellite” that would beam Internet connectivity to areas that had none. Boeing wants to build a new mid-sized airliner to be flying by 2025 – a middle-of-the-market jet. Call it a Boeing 797, or a New Middle Market Airplane, or the NMA. Reports say the engine manufacturers were asked to respond to a Boeing RFP by June 27, 2018. Boeing wants 25 percent less fuel burn per pound of thrust than the engines used on Boeing’s 757 planes. 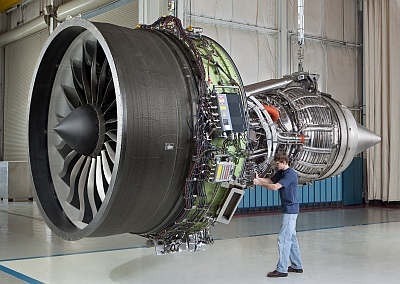 The big three engine manufacturers are named: CFM International, (the General Electric – Safran joint venture), Pratt & Whitney and Rolls-Royce. See also, This is Boeing’s NMA by Jon Ostrower. Under this concept, the aircraft would fly at Mach 5, three times faster than Concorde, and cruise at 95,000 feet. It would be smaller than a 737, with both commercial and military applications. At the recent AIAA conference, Aviation Week’s Guy Norris noticed a model of an “Advanced Aerial Refueling” aircraft in the Air Force Research Lab’s area. The Air Force may be looking for a more survivable aerial tanker. Passengers are being asked at security checkpoints by the TSA to remove their snacks and other food items from their carry-ons and place them in plastic bins for separate screening. This is a TSA recommendation to screening supervisors, not a strict policy. Some food looks similar to explosives which results in a secondary inspection. The intent here is to prevent that additional inspection. They’ve been talking about a third runway at Heathrow for years. It’s a contentious issue but now a parliamentary vote has passed that would allow construction of a third runway. Under the proposal, passenger capacity at Heathrow could jump from nearly 80 million passengers per year to 110 million by 2030. NASA flight tests in a Gulfstream III research aircraft flying at 350 feet demonstrated a “significant reduction” in the noise generated by aircraft operating near airports. The jet had porous landing-gear fairings, an Adaptive Compliant Trailing Edge wing flap, and chevrons near the leading edge of the landing-gear cavity with a net to modify the airflow. This represents about a 10% reduction in training time. Airplane Geeks reporter-at-large Launchpad Marzari talks with John P. Jones and John Linardose from the Air Evac Lifeteam which provides air ambulance service at the Circuit of the Americas (COTA) outside Austin, Texas. 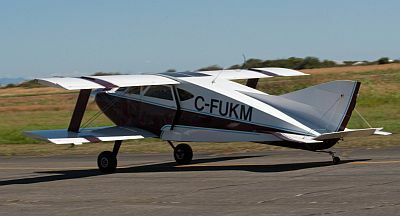 Listener Nicki continues her pilot training series with installment 13 about her new flight instructor. Vote for your favorite American air show! 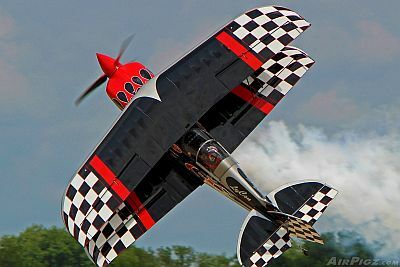 David was again asked to provide a list of the 20 best airshows for USA Today. The Hiller Aviation Museum in San Carlos, California will be holding an Open Cockpit Day on July 11, 2018. 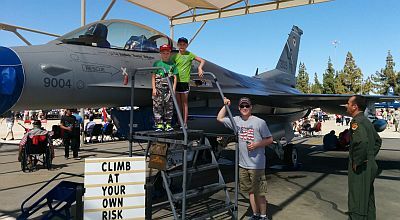 While this fabulous museum is relatively unknown to the general public, it has a fabulous collection of more than fifty aircraft and numerous interesting artifacts and displays. This entry was posted in Episodes and tagged airmail, B797, Facebook, Goodyear, Heathrow, hypersonic, NASA, Tanker, TSA, USAF on July 4, 2018 by maxflight. Industry analyst Henry Harteveldt returns as our guest. Henry is now with Hudson Crossing. Previously, he was Chief Research Officer and Co-Founder of Atmosphere Research Group, and before that he was with Forrester Research. We talk with Henry about the merger of US Airways and American Airlines, including labor relationships, maintenance, competitive effects, the merging of company cultures, and other steps necessary before the deal is done. We also touch on airline brand loyalty and airline fees. 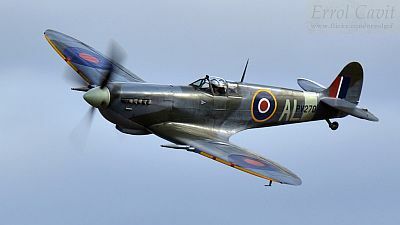 This week David takes a break from his Aircraft of the Week segment and gives his views on budget sequestration, a means of budget control used under the Budget Control Act of 2011. We’re joined by Ben Ippolito, a PCDU team member and Air Traffic Controller, to discuss future changes to air traffic management in Australia and the news that authorities are looking at ways to better integrate civil and military systems. This week we visit the world’s largest dedicated helicopter museum. With over 80 aircraft from all parts of the world its a wonderful place for all Avgeeks and certainly a hidden gem of a museum. 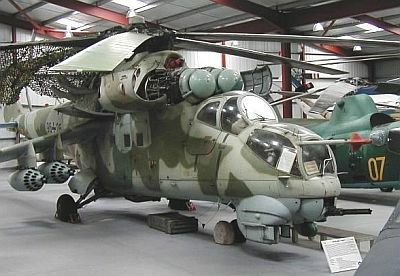 For more, see The Helicopter Museum website, The Helicopter Museum on Facebook and @HeliCollections on Twitter. This entry was posted in Episodes and tagged A350, American Airlines, Cirrus, merger, Tanker on February 20, 2013 by maxflight.